After moving in and setting up my studio, then immediately doing a 10-day painting project, I find myself once again organizing and cleaning. 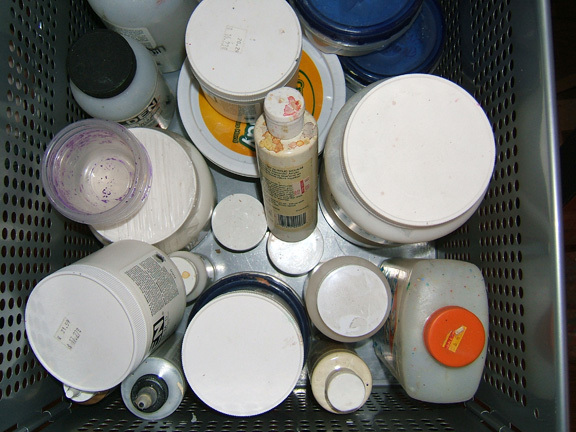 Here are some pictures that I thought you might enjoy, showing how I sort my materials. 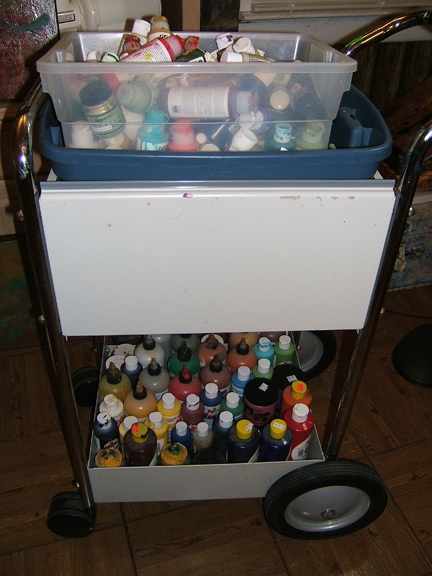 Postal cart that I use to house my paints. I love it because it moves anywhere I want. 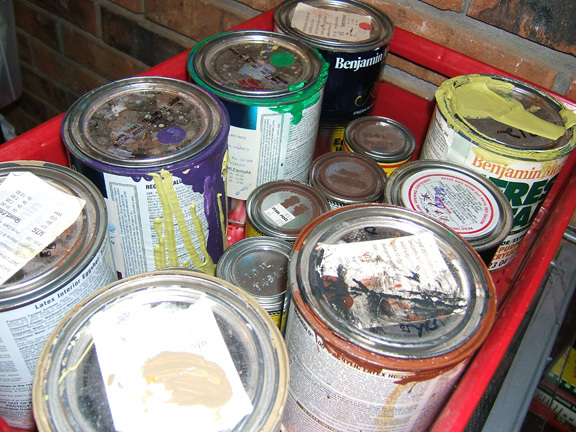 The top section is stacked with tubs of different categories of paints. 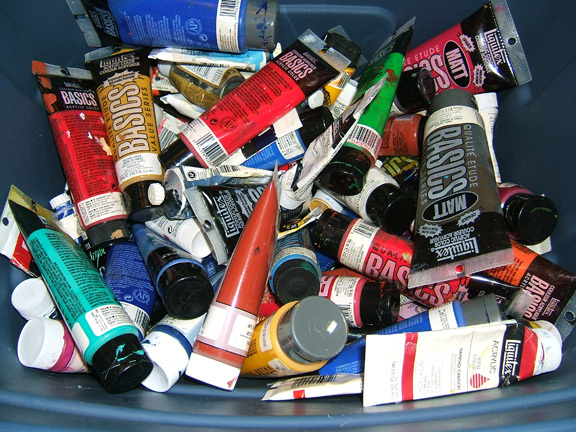 The top tub contains my favorite and most-used colors of fluid acrylics. 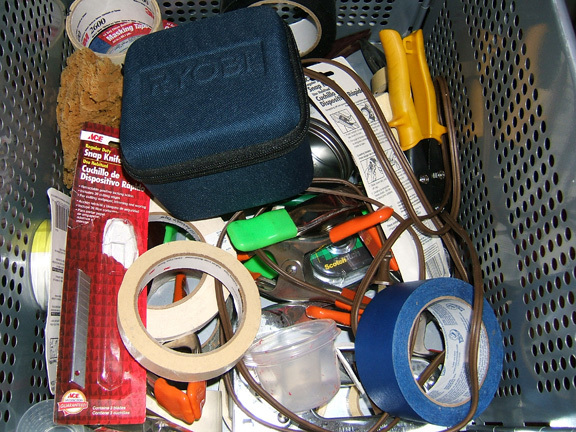 Top drawer of metal cart, holding miscellaneous tools such as heavy duty staplers, clamps, knives, tape, laser level, extension cords, etc. These are just a few shots of my organization in the studio. I will continue tomorrow with more pictures showing how I’ve sorted stuff. Hope you’re having a creative week! 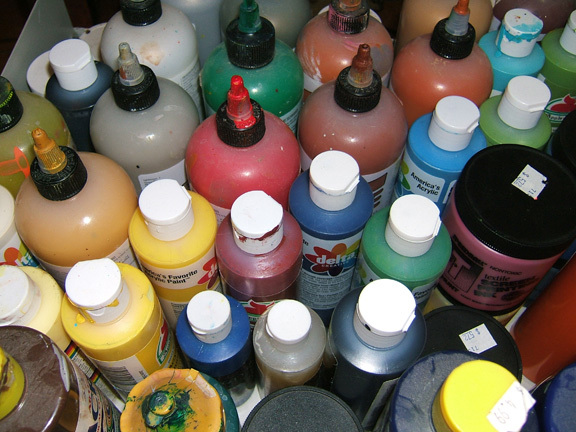 I just found your blog, and I am just wanting all of that paint for myslef;) Can’t wait for the day I have an actual studio! Thanks for visiting and commenting, Trish! Glad you enjoyed the pictures. I need a postal cart! Annette, what a serendipity. I had the opportunity to buy one in a garage sale. I am ashamed to even tell you how cheap it was. They are expensive new. But still, you might be able to find on on eBay or some place like that. 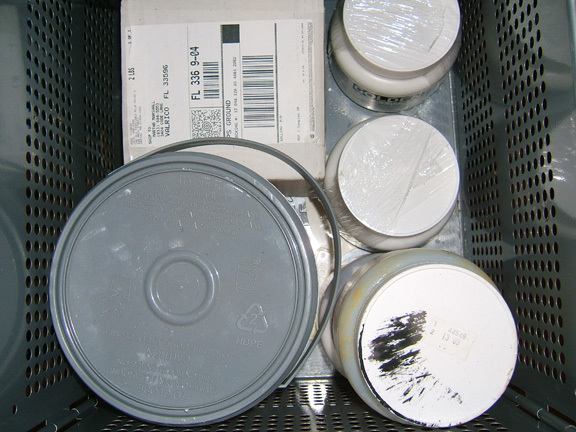 PS – Here’s a link to postal carts. Great organisation Martha and very interesting to see it. I’ve been doing similar, and all on wheels, as my lounge is also my “studio”, so the stuff has to be moved out very quickly when I have visitors. 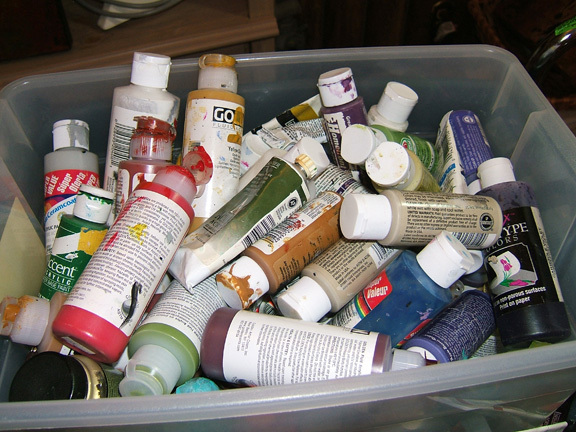 I reduce my hours next month (phased retirement) so finally will have more time to paint, and garden. Can’t wait! Sandra, I know you must be looking forward to getting more painting and gardening time. That’s going to be so nice! Thanks for the Postal Cart link, Martha. Good to have an idea of dimensions, etc. I will keep an eye out for USED! 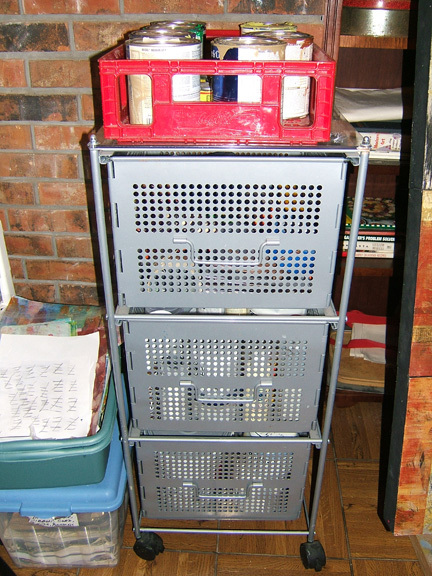 The postal cart is oh so cool, but when I couldn’t find one I went to plan B and got a utility cart from Mac Tools (my husband was a distributor at the time) and it’s been a great addition to my studio. Below is the link. It costs more than the postal cart, but it’s also larger and made from a composite material, so no dings or rust (do I sound like a salesperson, or what!). I would look for a used one, I bet there are some out there. Happy hunting! Love that one too, Kim! I’m sure there are used ones of both styles out there. They are the kind of thing that if it’s in your way, you gotta get it gone. I know that feeling, during my recent move!! it’s great seeing how fellow artists work and organize their spaces. we can all learn from each other in this way. Stephanie, I love looking at other artists’ studios too. It always gives me ideas and inspiration.